Even since Hubby saw Hugh F-W smoke fish in an old bread bin on River Cottage Autumn he’s wanted to give it a go. Hubby being the resourceful man he is, he didn’t want to buy a brand new smoker, but make one himself. 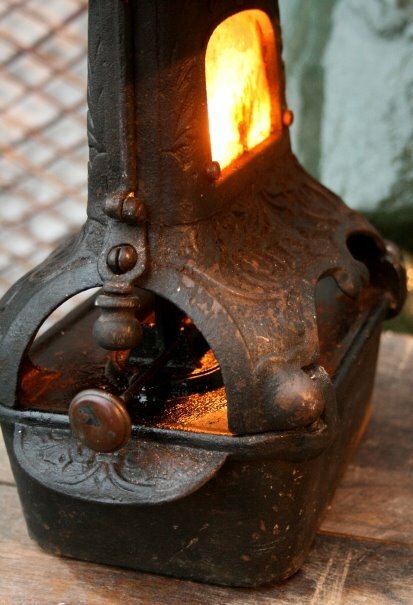 Hubby bought the bread bin a few months ago on ebay and last week the heat source he had been looking for, an old paraffin lamp/stove, finally arrived. 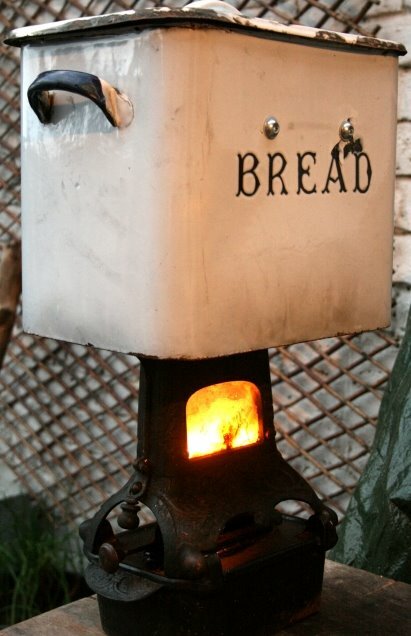 The bread bin was then lined with oak chips that once heated begin to smoke. Hubby also has some whisky soaked chips somewhere, which should give an interesting flavour. There is essentially 2 types of smoker. A hot smoker and a cold smoker. A cold smoker is use for flavouring a food, but not cooking it whereas a hot smoker not only cooks the food, but also flavours it. 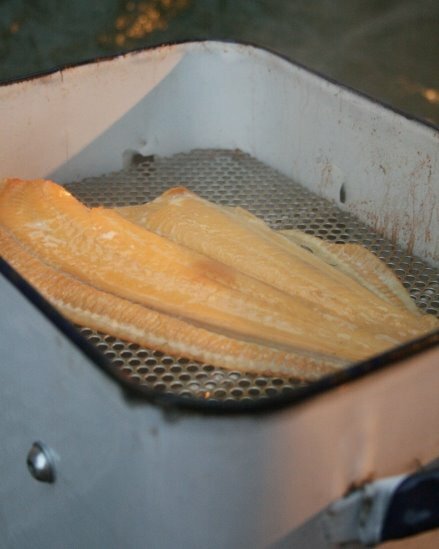 In tonights fading light Hubby decided to try out his new toy by smoking some plaice. The fish was cooked & smoked in 15 min. I have to admit smoked fish isn’t really to my taste so I only had the tiniest amount, but Hubby was impressed with what he had achieved and is interested in trying to smoke other things. 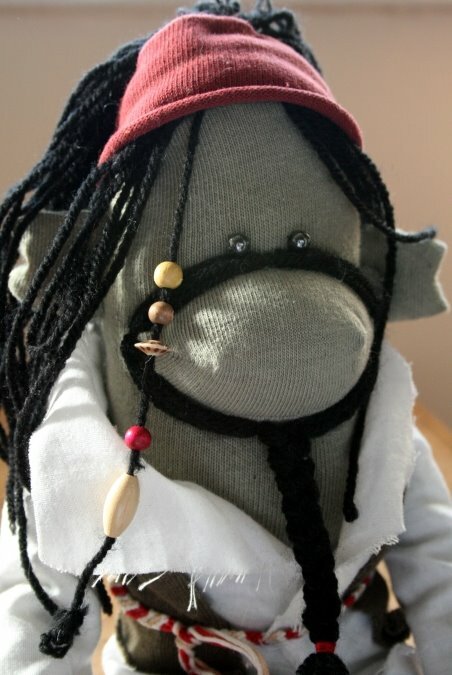 The cold smoker is now next on his to-make list. After making custard creams last year it has always been my intention to adapt the recipe to make the long-gone biscuit Coffee Cream. Coffee Creams were the biscuits that could only ever be found in the festive Foxs (or was it Jacobs) biscuit tins given to you by Grandma for Christmas. As I love anything coffee flavoured I always snaffled them up, but not before I had sampled all the other biscuits (especially the posh Jammy Dodgers) first. As any coffee lover will tell you, coffee flavoured sweets/biscuits/cakes are not loved by everyone and are more often than not left till last. This is when us coffee lovers swoop and have our last coffee hit. Now after a bit of experimentation I admit I’ve sorted the icing, but haven’t got the biscuit dough quite right and no I know they don’t look like the originals. The biscuits are delicious in their own right, but don’t taste exactly like the hallowed Coffee Creams. Although I put coffee in the biscuit dough you can’t taste it. I’m going to work on the recipe and try and get it closer to the flavour I remember. I also need to work on extracting a stronger coffee extract. Any tips? 1) Preheat oven to 180oc (160oc fan). For the biscuits mix flour and baking powder. Add butter and rub until you get a crumble like texture. Beat coffee into egg in separate cup. Add sugar then gradually beat in egg/coffee mix (you may not need all the egg) until you have a soft dough. Wrap dough in clingfilm and rest in fridge for 20 min. 2) Roll dough to around 4mm and use cutter to cut out round. Place on lined baking tray and bake for 15 min. Cool on rack before sandwiching them. 3) To make coffee cream, beat together icing sugar and butter until you have a cream. Add coffee and beat again until you have a smooth coffee cream. 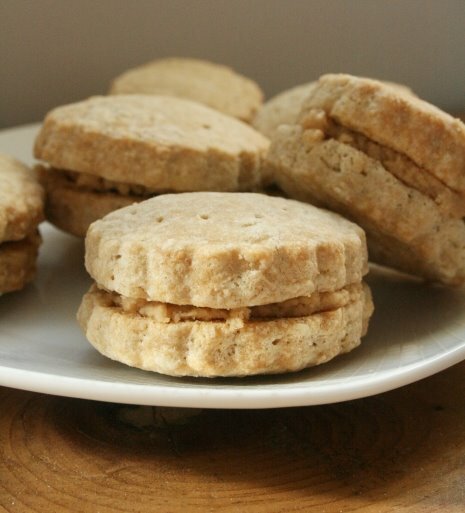 4) Sandwich each biscuit with about 1 tsp of coffee cream. 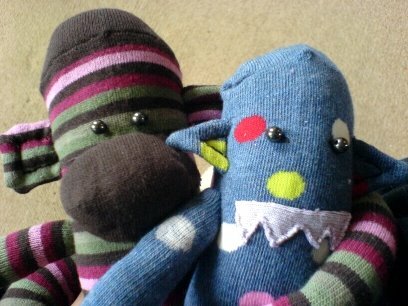 Say “Hello” to Bink, the first sock monkey I made a few years ago and who currently presides by the fruit bowl making sure I’m doing the work I should be doing (of which I’m clearly not right now!). He’s called Bink because when I was little if I didn’t know the name of something I would either call it a Bink or a Blimp. 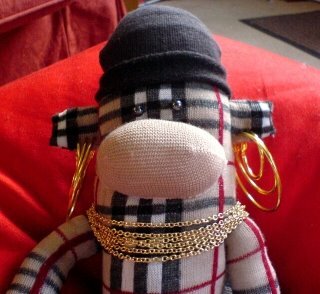 His best friend is Captain Jack Sock Monkey who is a bit camera shy and lives upstairs. I have serious Endoftermitis. 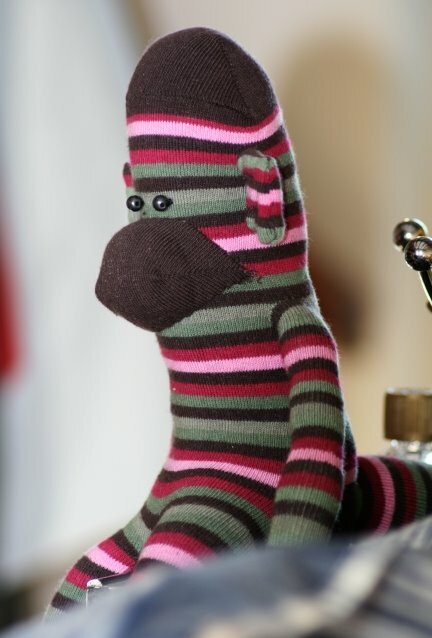 A well known condition within the Education sector that brings on lethargy, overwhelming urge to gorge on custard creams, daydream about coming up with the perfect recipe for Coffee Creams…and anthropomorphise sock monkeys. Work is hectic and I’m getting home each night exhausted. Bring on Easter holidays. Along the DIY project another reason for me being quiet is that I’m trying to write a killer job application for a job that would be perfect for me. I don’t want to give too much away and jinx myself, but keep your fingers crossed. The long absence from my blog primarily has been due to major DIY project happening at the cottage. The cottage has been covered in plaster dust and wood shavings, hardly conducive towards cooking. When we bought the cottage 4 years ago the downstairs was carpeted with a lovely cream carpet. Looked great for about…10 minutes. Who ever thought a cream carpet was a good idea in a cottage with a fire was wrong. I got so fed up with cleaning it I suggested a couple of weeks ago that we pull it up and put down flooring instead. In an ideal world we have loved solid wood flooring, but it costs more than we could afford so instead we’ve put down a antique look laminate flooring (god bless IKEA). While pulling up the carpet we came across a surprise. 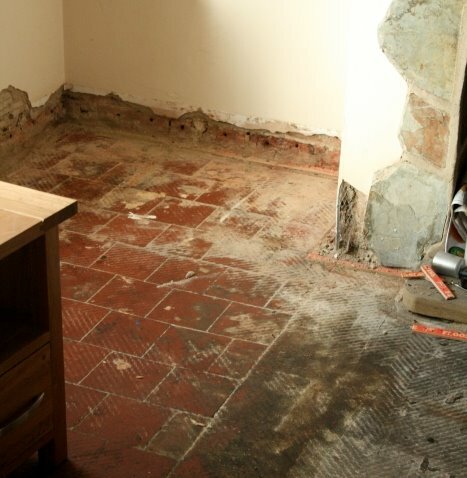 We were under the impression that under the carpet there was modern concrete, instead we found the original 18th Century tiled floor. Some of the tiles were damaged and we weren’t in the position to restore the tiles so instead have protected them and hidden them under the new flooring. Maybe in the future a future tenant of the cottage we have the money and time to restore the tiles. Spring is slowly making an appearance in the garden. The garlic is sprouting nicely and the birds and bees have been busying around. I’ve also discovered a new currency…eggs. I’ve done a few jobs/favours for friends recently and have been paid in eggs from their hens. I’ll never complain about being paid in food! I now have a wonderful collection of hens eggs in lots of different hues. I also have some strawberry plants winging their way to me. The distinct lack of cooking hit me at 0645 this morning. I just couldn’t sleep and had to bake. These cookies were the result; my attempt at trying to make cookies slightly healthy. They remind me of the Anzac biscuits from my school days, but not as hard. The muscovado sugar caramelised leaving the cookies nice and chewy. For this recipe I use muesli base which I buy in a vegan wholefood store, but I have also seen it in places like Holland & Barratt and Sainsburys. 1) Preheat oven to 190oc. Beat together the butter and two sugars then stir in egg and vanilla extract. 2) Sift the flour, salt and baking powder into the bowl then fold in muesli base and sultanas. Combine well. 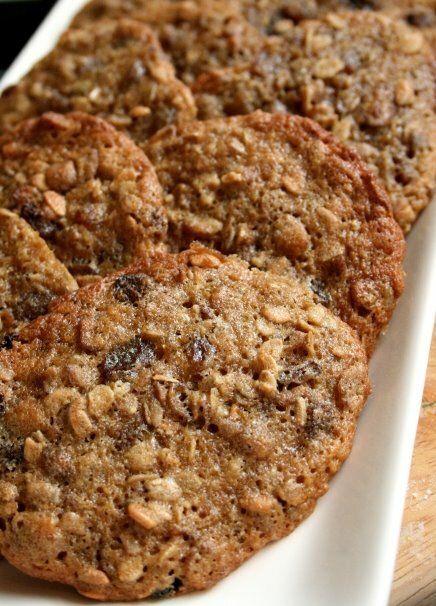 3) Line a baking sheet with parchment and place spoonfuls of the mixture onto the parchment. Leave a big gap between each blob as this mixture has a tendency to spread. I had to bake the cookies in two batches. Bake for 8-10 until golden. Allow to cool for 5 min before transferring to a wire rack. I’m a bit of a melting pot. Half English, Half Welsh but with German influences from the 3 years I spent living there; so for all the Welsh people out there, an albeit belated, Dydd Gwyl Dewi Hapus…or Happy Saint David’s Day for you non-Welsh speakers. To celebrate I made Bara Brith and lobscowse (a Welsh version of Scouse). 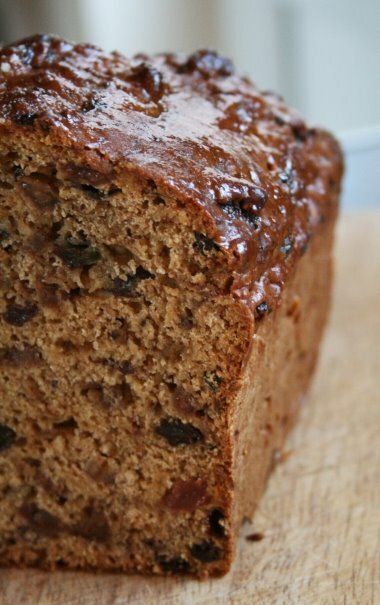 Bara Brith, translated literally, means speckled bread and is a traditional cake in Wales. There are essentially two types of Bara Brith. A version made with yeast, or a longer lasting version made with self-raising flour. I opted for the self-raising flour version as there is only 2 of us to eat it and wanted it to last. After some searching around I came across an authentic sounding recipe. Few problems, it wasn’t particularly well written and the recipe stated a 1lb loaf tin. No way was all the cake mix going to fit so used my baking experience and put it in a 2lb loaf tin instead. I’m glad I did as it filled a 2lb tin perfectly. I only have feint memories of Bara Brith so wasn’t totally sure what it was meant to taste like, but I think I certainly got close with this cake. It was a surprisingly delicious cake, with a pleasant marmalade taste throughout the slice. The texture was also just right, perfect for lunchboxes. Not bad considering I was winging it towards the end of the recipe! It looks similar to my banana bread that I made last week, but it tastes very much different. 1) Soak the fruit in the tea overnight. Don’t drain! 2) Preheat oven to 170oc and line a 2lb loaf tin. In a large bowl mix together the tea soaked fruit, the remaining tea, flour, marmalade, egg, mixed spice and sugar. Pour into the tin and bake for 1.5 hours, or until a skewer comes out clean. If the top is browning too much, cover with foil. 3) Once cake is baked, allow to sit for 5 min before removing from the tin, then brush with the honey to get a shiny glaze. Allow to cook fully before slicing.